— Erin Bohlin, Sirius Decisions Research Director, in Bringing Intelligence to Events webinar. When was the last time you accurately measured the success of an event, let alone proven positive ROI? We’d venture to guess it’s been a challenge at your organization, and yet you continue to invest in events, year after year. You’re not alone. 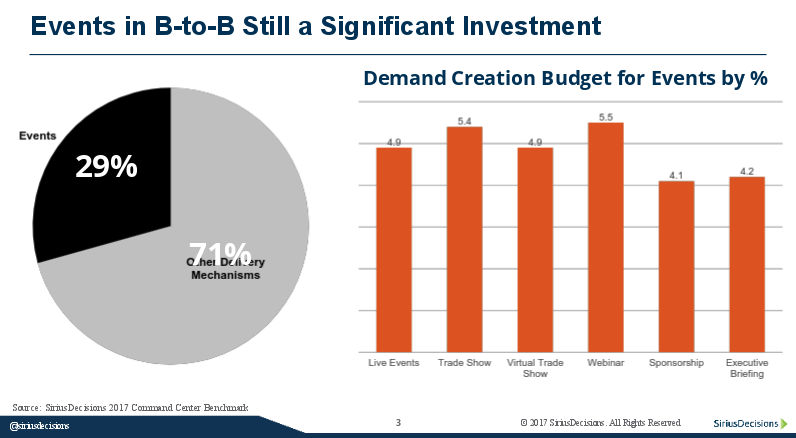 According to a SiriusDecisions study, nearly 30% of demand creation budgets for B2B organizations are allocated to various events. Accurate measurement of event ROI, however, continues to be a hurdle that many organizations struggle to overcome. The reason ROI is often hard to prove can be narrowed down to three common pitfalls. At the root of the problem is a failure to tie event planning, management, and execution strategies directly to the success criteria. If your goal is to accelerate existing leads through the pipeline, what systems have you set up to enable this? Tying the goals of your event to your measurement criteria is critical to event success. In our webinar, Bringing Intelligence to Events, atEvent CEO Uzair Dada teamed with Erin Bohlin to discuss further why proving event ROI is such a challenge—and how, with the right tools and knowledge, events can be a successful part of any marketing strategy. While the live webinar has passed, it’s not too late to learn how you, too, can turn your next event around. Just click below to access a recording of the webinar.